Bird feeders are an incredible way to enjoy nature and help out your neighborhood birds. 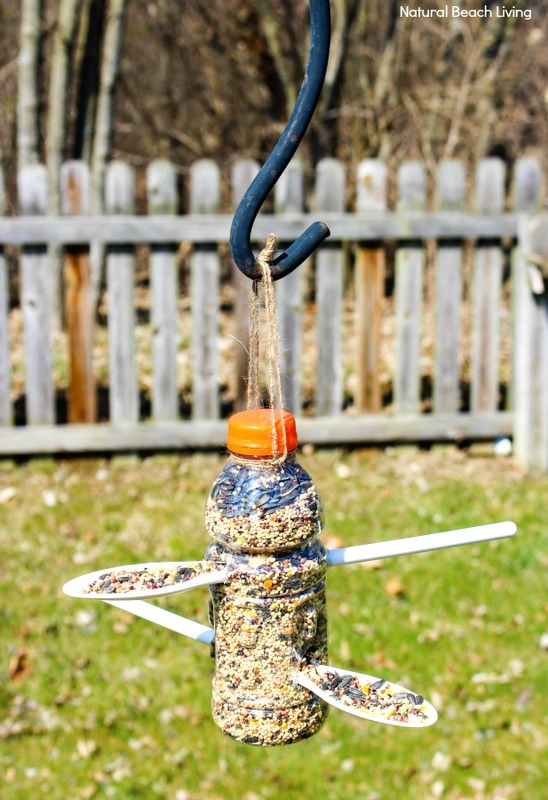 Today we are sharing a simple bird feeder made out of materials you probably already have around your house. 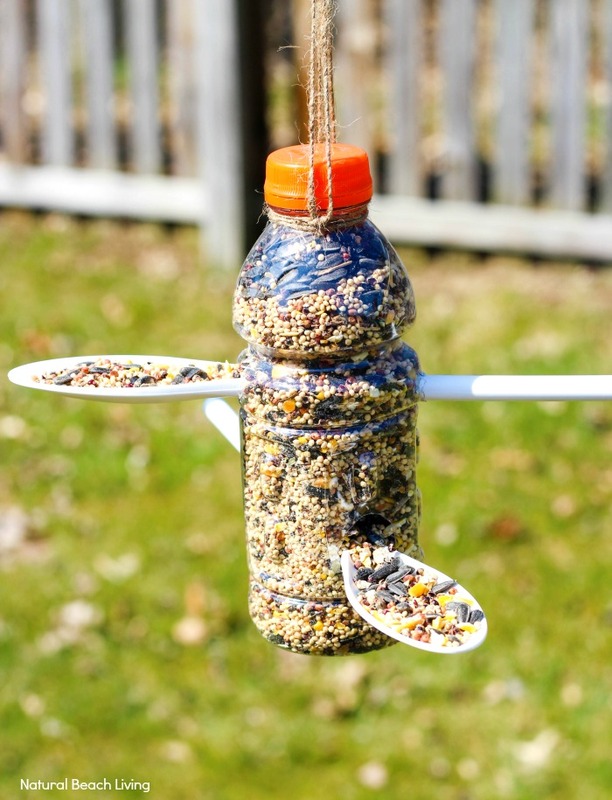 If you have an empty plastic bottle, juice container, or soda bottle, you can upcycle a bird feeder in 10 minutes. 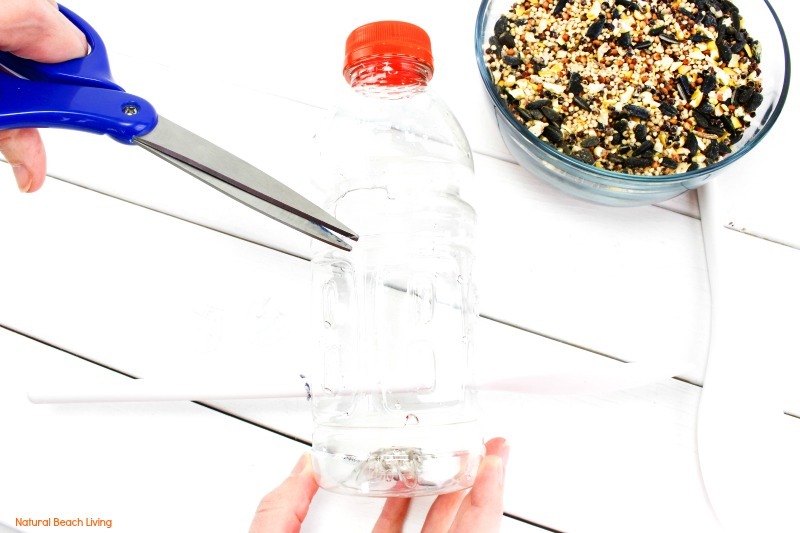 Are you ready to see how easy it is to Make a Bird Feeder Out of a Plastic Bottle? Let’s get to it. 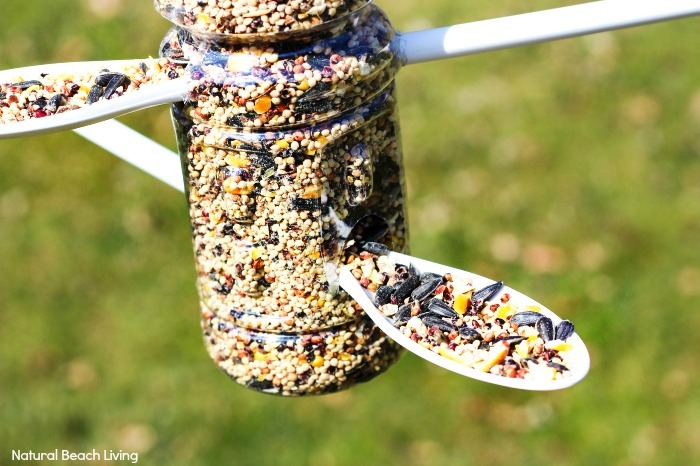 This is one of the easiest homemade bird feeders you can make. 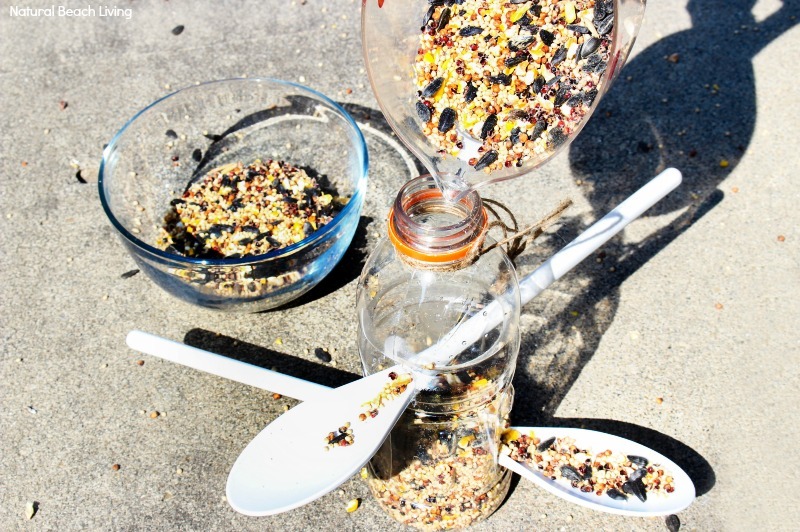 All you need is a few supplies, and you’ll have lots of backyard birds flocking to your new recycled bird feeder. A lot of people think about making homemade bird feeders only in the winter time, but we enjoy making bird seed ornaments and DIY bird feeders all year long. Providing the backyard birds with seeds, berries, and nuts is a joy to watch and be a part of, plus it helps the birds get the nutrition they need. 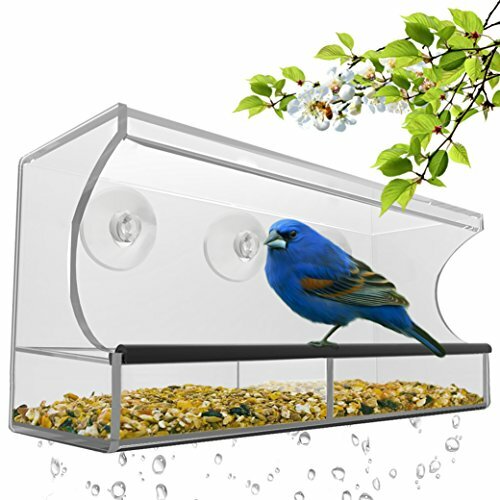 What you will need to make your Plastic Bottle Bird Feeder is in this picture below. However, I have it displayed in list form towards the bottom of the page. Enjoy! Let’s get started, near the bottom of the bottle, cut a little larger than a quarter size hole into the side of the bottle. Poke a spoon handle through it until it hits the other side of the bottle and cut a small hole there so the handle can go through. Repeat step 1 higher up on the bottle for the other spoon. Tie a piece of twine around the neck of the bottle as a hanger for the birdfeeder. Fill the bottle from the top with the birdseed and hang your feeder outside for the birds to enjoy. The seeds will fall out onto the spoons as the birds eat. 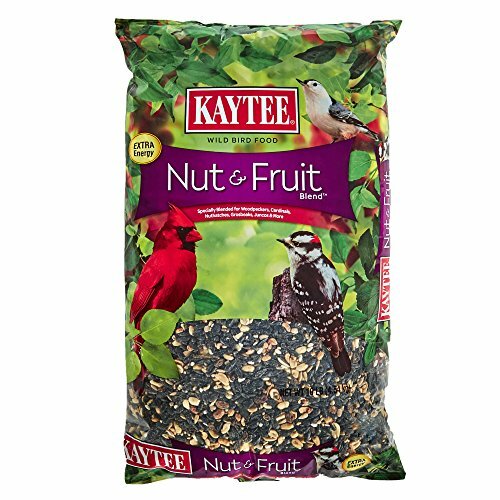 It’s a perfect treat for your backyard birds. 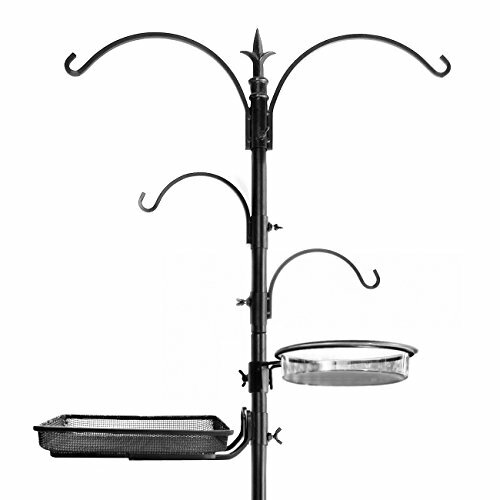 Sit back, relax and watch your lovely feathered friends enjoy their new bird feeder. 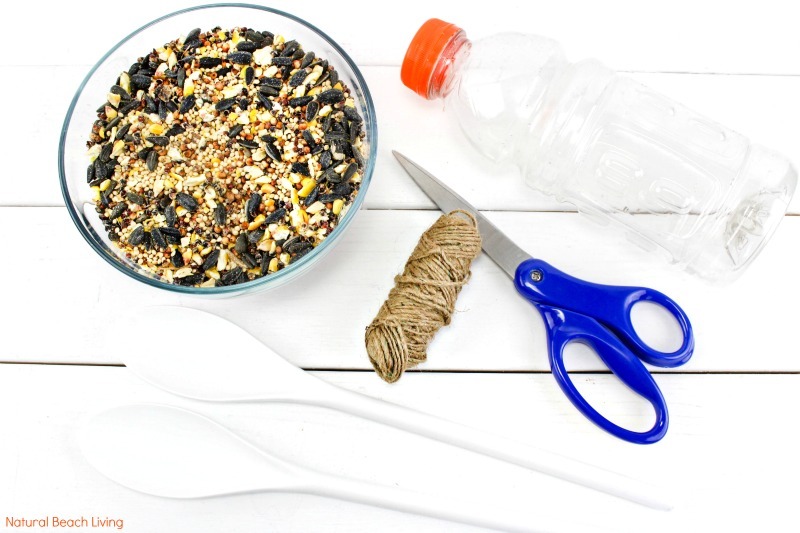 Are you ready to make a bird feeder out of a plastic bottle to hang up for your feathered friends? 1. 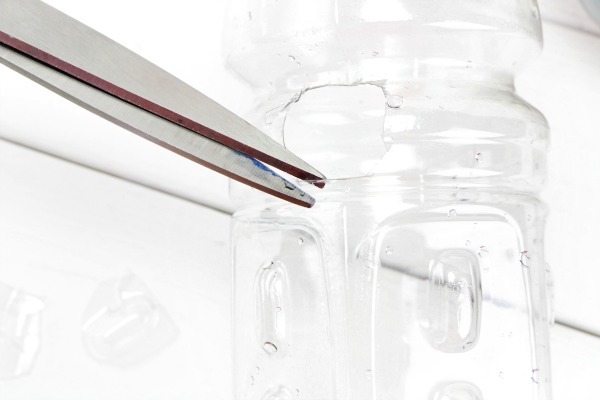 Near the bottom of the bottle, cut a little larger than a quarter size hole into the side of the bottle. Poke a spoon handle through it until it hits the other side of the bottle and cut a small hole there so the handle can go through. 2. Repeat step 1 higher up on the bottle for the other spoon. 3. 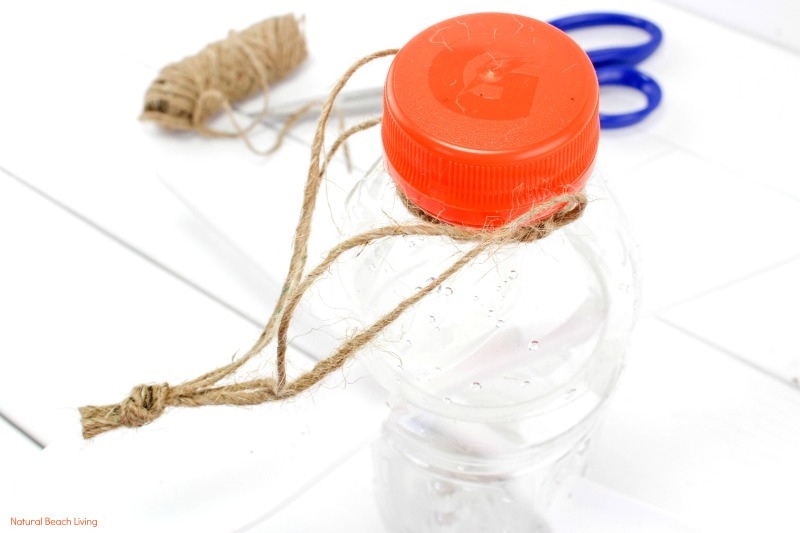 Tie a piece of twine around the neck of the bottle as a hanger for the birdfeeder. 4. Fill the bottle with the birdseed and hang your feeder outside. 5. The seed will fall out onto the spoons as the birds eat. 6. Fill up when needed! 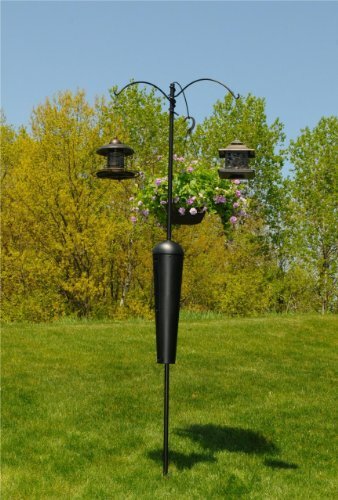 Have fun watching your backyard birds flock to your new homemade bird feeder. 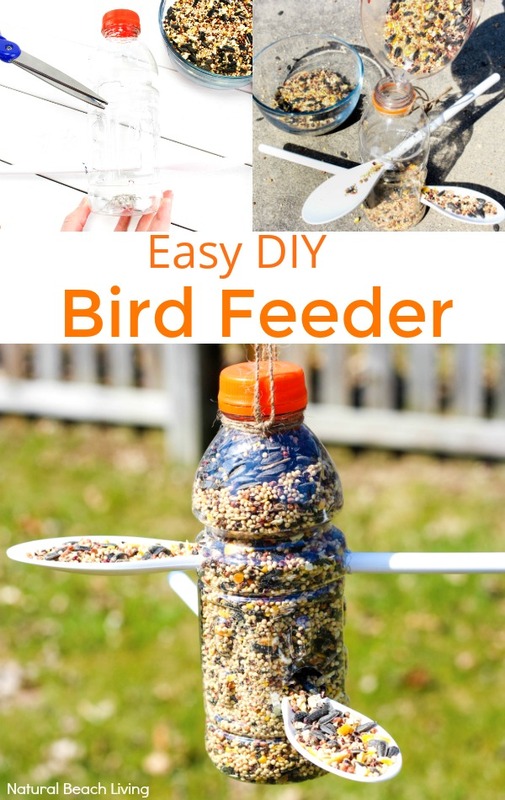 Here You’ll Find The Best Homemade Bird Feeders including Plastic Bottle Bird Feeder, recycled bird feeders, Bird Seed Ornaments, Apple Bird Feeder, Pine Cone Bird Feeder, Kid Made Bird Feeders backyard bird printables.